The PlayStation VR offers you a whole new gaming experience. You can also share your joy with others by using the Share function. - The recording of VR games is 360-degree material. However, the storage of these pictures and videos is something different, as in the normal screenshots of the PS4. - The recording of videos and pictures is done in the recording gallery of the PS4. 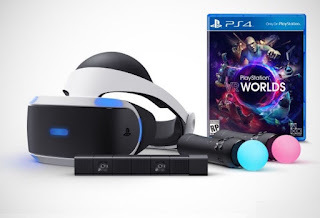 - On the TV your pictures and videos recorded with the PS VR are unfortunately only output in 2D, since the VR-view can be reproduced badly here. Also, if you stream, your friends see the game only in 2D. - If you want to stream, you need a camera that records your face, because the PS VR takes your PlayStation camera in its entirety. For normal streams, this camera still captures your face. - If you hold down the share button, then you can take a screenshot. - If you press the Share button twice fast, then the video recording starts. - If you then press the Share button twice, then stop recording the video. - A recording icon on your display indicates that you are recording. From the Share menu, you can make various settings. Here you have the possibility to determine how long recorded videos should be or when the Share menu opens. Meanwhile, by the way, video clips of a length up to an hour are possible. The video is then saved in the recording gallery of the PS4 and has a format of 720p, even if the game actually has a resolution of 1080p. - Now press the Share button located on your controller in the upper left corner of the button. - Now choose the option "transfer game" and decide for a stream service, usually the Twitch or UStream. - Now you still have to connect your profile to the PS4 and give your streaming a title. - You could now theoretically make even more streaming options and settings. - If everything is done correctly, then start the stream with "Start Transfer" and you can get started.